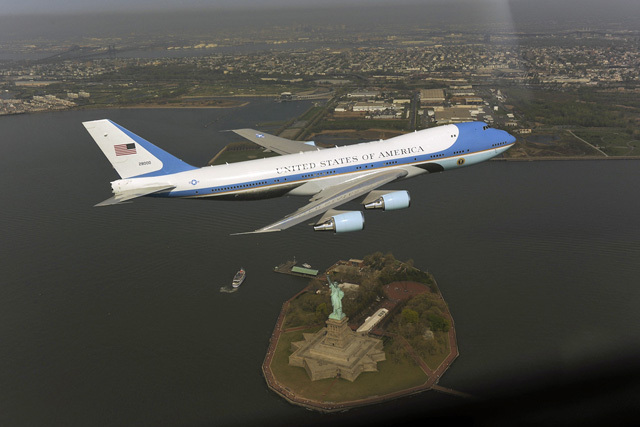 You may remember the massive panic that ensued last spring when Air Force One showed up the skies of New York City for a photo shoot. This was a stupid project on any number of levels. First, the White House treated this as top secret or classified or “decoder rings only” or some such silliness. So while a few New Yorkers knew about this, no one bothered to tell the people who work in various high rise towers. Understandably, in a city that lived through terrorism attacks using airplanes, folks got jittery when a 747 and some fighter jets flew very low over the city. So next time you hear someone proposing a massive secret project that is likely to spread panic throughout one of the largest cities in the world, ask yourself if the same thing could be done by the geeky kid next door. Top image from the Gothamist. I wonder if the flights over the Statue of Liberty wasn’t intentional. One of the things that have been going on since Obama’s inauguration is a quiet-but-persistent assault on the Wall of Fear erected by President George W. Bush. Obama and his wife have gone to a Broadway play on a Saturday evening. They did not use one of the standard “Air Force One” planes for this trip, which has special protection for the President. Obama and Biden–together–have gone out for Burgers in the DC area for lunch. As far as I know, no one even became sick from an undercooked hamburger. Just the fact that Biden isn’t hiding in a bunker somewhere, just in case, shows that President Obama isn’t giving in to fear. As a historical note, Presidents didn’t necessarily hide behind protection–even after Kennedy’s assassination. For example, Richard Nixon went out personally to talk to war protesters one early morning. There is still some distance to cover. A people in fear will hand over some of their rights for safety. I think the former professor of constitutional law is working on this problem. If I am right, I hope they fly close to the Capitol building and downtown Oklahoma City. It’s worth the cost. We have to get over irrational fear and start living again.